Easily remove DRM protection from iTunes M4P, batch convert Apple Music to MP3 or other DRM-free audio formats legally. Enjoy your Apple Music and AudioBooks freely without limitations on any device you like. Available for Windows and macOS. The latest version of Easy M4P Converter is fully compatible with iTunes 12.9.4.94. Step 1: Click the "Download" button above to download and install M4P Converter on your Mac or PC computer. Step 2: Launch program, Click the playlists category and select music you want to convert in the file list. Step 3: Click the 'Convert' button to start converting M4P to MP3 or other unprotected audio formats. Losslessly convert purchased M4P songs and Apple music tracks to unprotected audio format like MP3, M4A, AAC, AC3, AU, MKA, FLAC, M4R, AIFF, etc. that can be played on dozens of compatible media devices. Only legal way to remove DRM protection from M4P songs, Apple Music downloaded, or purchased from iTunes store and AA/AAX audiobooks from Audible store. So stop worrying about the DRM protection issue. Much More than an M4P Converter. In addition to convert iTunes M4P music, Easy M4P Converter also acts well as an audiobook converter. Convert audiobooks including Audible AA/AAX and iTunes M4B. Ability to extract audio tracks from any video in iTunes, including iTunes DRM M4V video. It can convert almost all video formats, e.g. M4V, MP4, MPEG, MKV, WMV, MOV, AVI to popular audio with 100% original audio quality and ID tags kept. It also supports conversion of wide range of unprotected audio formats, such as M4A, AAC, AC3, WAV, MP3, AU, AIFF, FLAC, M4R, MKA, CDA, Apple Lossless, and so on. Easy M4P Converter is a solid solution to your iTunes music conversion needs. Various output formats such as MP3, M4A, AAC, AC3, M4R, FLAC, AIFF, AU, and MKA with CD quality suits your needs. 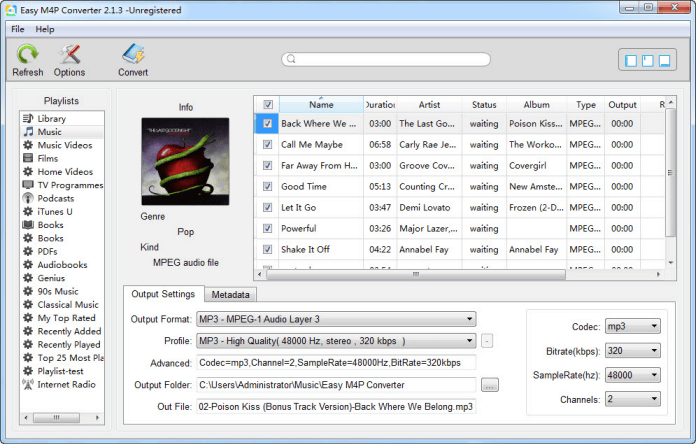 ID Tags information such as artist, album, title, cover and genre will be preserved in M4A or MP3 output files after conversion. Offer up to 16X faster conversion speed to save your time. The batch conversion mode and multi-thread process allows the user to convert multiple iTunes audio, playlists or albums at one time with turbo-speed. To make it more advanced, you can fully customize output audio by adjusting audio parameters e.g. choose audio quality, codec, channel, sample rate, bitrate and volume gain to optimize your M4P conversion. More other features, such as intuitive interface, edit metadata, 7 languages supported, advanced iTunes integration. No extra virtual drive needed, compatible with the latest Windows 10 & macOS Mojave. Easy M4P Converter is designed to easily convert a variety of iTunes media with the intuitive interface. Guide to show you how to convert purchased Apple Music to unprotected MP3 format for play anywhere you like. This article is a guide on how to remove DRM protection from iTunes audio and convert them to MP3 without quality loss. The step by step guidance on how to convert iTunes M4P music to MP3, M4A, or AAC on Windows. "By far the best iTunes M4P converter out there. In three easy steps you can convert apple music to MP3, It has everything and is very user friendly. Wonderful!" "Works best of all I've tried. Spend a lot of money with other, but this one is just doing a well job. The software converted a lot of protected M4P perfectly." "Great way to convert iTunes protected M4P tracks to MP3 files on Windows PC for playback on my all Android devices, It works just like magic." "Love this app, Over the past week I converted hundreds and hundred of iTunes M4P songs to MP3 audio so I could play them on my Sonos system." "Does exactly what it says and is easy to handle. Great windows app for convert Apple music and Audible audiobooks to MP3 with ease, Works flawlessly." "I've used Easy M4P Converter to convert purchased apple music to MP3 format I can play on my car player and it did it quickly and without any problem."